Announced in the summer of 2011 and released in the autumn, the Olympus 45mm ƒ/1.8 m.Zuiko is a fast telephoto prime designed for the PEN series of digital camera. With its 2x crop factor, the equivalent field of view is 90mm, offering the opportunity for portrait shooting with a very thin depth of field. The lens is available now, with several optional accessories including a circular lens hood, for around $400. The Olympus 45mm ƒ/1.8 m.Zuiko is a very sharp lens. Wide open at ƒ/1.8, the central region of the image is tack-sharp, with very light corner softness; there's not much difference in stopping down to ƒ/2, but by ƒ/2.8, the lens is as sharp as sharp gets. It's sharp all the way through to ƒ/16, where a slight hint of diffraction limiting is present, but it's still really sharp even at this aperture. At ƒ/22 there is only very slight softness across the frame. 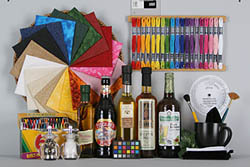 In short - this is really excellent performance for sharpness. There is a light amount of chromatic aberration present in images shot at wide apertures - it's noticeable at ƒ/4 and below, mostly in the corners and only in areas of high contrast. The effect is magenta-blue fringing, and it's probably only visible by viewing 100% crops. By ƒ/5.6, the effect is almost negligible. Corner shading isn't really a factor for this lens - the only point it is even noteworthy is when the lens is used wide open at ƒ/1.8, where we note extreme corners that are a third of a stop darker than the center. In any other setting, corner shading is negligible. Distortion is also minimized in this lens, showing just -0.1% pincushion distortion in the corners; this really isn't a lot to write home about. Olympus E-P1, with 90mm f/1.8 m.Zuiko, shot at f/1.8. Love that bokeh. 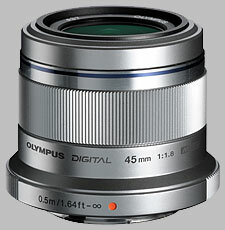 The Olympus 45mm ƒ/1.8 uses Olympus' MSC (Move-Still-Compatible) technology, making the lens fast and near-silent to autofocus; the lens focuses between close-focus and infinity in less than a second. Autofocus results can be overridden at any time by simply turning the focusing ring. The lens does provides poor macro ability at best - at its close focusing distance of 50cm (around 20 inches) it provides only 0.11x magnification. The Olympus 45mm ƒ/1.8 m.Zuiko looks like a metal lens, but in fact it's plastic with a bright silver finish; you won't miss the metal chassis as this keeps the bulk to a minimum (it's only 116 grams, just over 4 oz) and pairs nicely with the PEN camera. It's small enough that it can be slipped into a pocket when not in use. The lens uses 8 groups of 9 lens elements, including two E-HR (Extra-High Refractive index) elements in its design, as well as 7 circular blades to create the aperture (as well as smooth bokeh results). The lens features a metal mount and plastic 37mm filter threads, but does not have a distance scale, depth-of-field scale, or infrared index. 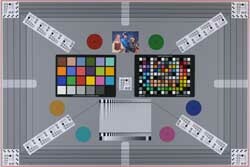 The lens has only one control on it, the manual focus ring. The ring is plastic with thin ribs, about 5/8'' wide. The focus ring sits in the center of the lens and is very smooth to turn, yet stiff enough that it will stay where it is set. With its fly-by-wire focusing design, the lens does not have any stops on it to let the user know it has reached either its close-focusing distance or infinity distance. An interesting (and included) accessory is the DR-40 Decoration Ring: as Olympus states, the ring ''can be used to conceal surface irregularities on the hood mount at the front of the lens and create a sense of unity and coherence.'' Essentially, the lens hood is optional, and you can cover up the mounting points with a prettier ring that matches the finish of the lens. Removing the decoration ring exposes the bayonet mount for attaching the LH40B lens hood. The hood is a circular mount which can store reversed on the lens when not in use. As an optional accessory, it won't break the bank at $39. Given the newer nature of the micro four-thirds system, there aren't yet (at the time of writing) a lot of alternatives to choose from. With the MMF-2 adapter, one could mount this standard Olympus four-thirds lens onto a PEN camera. It's not really the same class of lens - the 50mm is a macro lens - so you're going to get much different performance, but a similar style of image. The 50mm tested very well, with excellent results for sharpness, CA, distortion and corner shading. We haven't yet tested this lens, but it will work with the PEN without an adapter, and will provide you with the same effective focal length, if not the fast aperture. With excellent test results, this is a no-brainer of a conclusion - it's a great and inexpensive addition to your Olympus PEN kit, especially if you're a portrait shooter. Outstanding value and fantastic image quality - there is no other lens of any make that will give you as much bang for the buck if you are into portrait photography. I wish it had the push-pull clutch manual focus ring like some of the other Olympus optics but that is really picky at this price-point. This lens is an absolute bargain. I have had this lens for ages, and I was blown away by the image quality. Nice quick AF and incredibly light. It is a great size lens and the only thing that you could improve on is the manual focus, which while fine in practice, doesn't offer the joy of the push-pull clutch manual focus rings on some of the other Olympus options. Even if they upped the price another $50 to include this, it would still be outstanding value. Build quality is fine with a plastic body make to look like metal. If you want a low-cost, compact portrait lens, just buy this. looks like metal, but actually plastic with silver finish. The last review of this lens was less than stellar, and I'd like to bring things up to date. I purchased the lens in like new condition, in original box. No lens hood was included, but I purchased a knock off for a very reasonable price, with no fall off on corners. The 2x factor makes this a 90mm portrait lens, with the fast f1.8 aperture, and small depth of field wide open. Distortion is almost nonexistent, and color rendition is bright and true. Focusing is fast, and very quiet. The lens works equally well for both stills and video. Although it looks like a metal lens, it is mostly plastic, with a silver finish. The mount is metal, however. The lens is very light and small, easily carried in a pocket when not in use. I always carry this one in my field bag, and use it frequently. There are used examples available, at very advantageous prices. A great addition to anyone's arsenal, and a fine performer. I only heard praise about this lens, but when I bought it I was a bit disappointed. Of course, it's a small, light and cheap lens, so don't expect too much - but since this lens was hyped a lot - I expected way more out of it. Imaged were soft, especially wide open and the focus speed was good (like with nearly all µFT lenses), but it was not outstanding. I thought I might have gotten a bad copy (and returned it), but at my photoclub both my buddies that ordered this lens, had the same problem. It has fast focusing and a pleasant bokeh. Portrait , Architecture or Landscape this is a seriously good pocketable lens. Light, sharp, fairly cheap = great value here. I don't give away 10s because otherwise manufacturers might get complacent, but this IS a terrific lens. I have marked it down for construction and there s no damned hood and its mainly plastic but in other terms its well crafted all the same. the plastic focus ring is a little coarse for me when making small autofocus adjustments. thats it. The bokeh is fine and about the same as an 85mm full frame at f3-5, but it sharp, cuttingly so in fact.. . The format needs good lenses and its generally true that its got them with examples like this. I just wish there was a bit more to come from the sensor. The Olympus 45 mm f1.8 Lens is a very Sharp Lens. Even at f1.8 the Lens is Already Sharp at the Center. Stopped down to f4.0 the Whole image Frame is sharp, EVEN THE CORNERS. The Olympus 45mm 1.8 lens is amazing, this is my first lens so i don’t really have much to compare it to. The depth of the focus is pretty amazing. This lens is a perfect portrait lens and is very good at taken photos at anything, because the lens does all the work for you. The auto focus is pretty darn fast and the colors are great too. For people who are not in to portraiture the Olympus 45mm is still an outstanding lens to have. i hope this helps anyone who is looking to invest in the lens. As good as they get - definitely one of the must-have-lenses for µ43rds. Just bought a second one for myself, because our first one almost never leaves my wife's camera. Yes, they are that good. Together with the Panasonic 14mm and 20mm pancakes, this makes the almost perfect travel kit - high quality, light, and affordable. better built than you'd imagine from some of the reviewers. optically? just to die for... this is such a nice lens. i'd feel very comfortable paying twice the price because 1. it doesn't have any real distortion, 2. it focuses instantly, 3. colour and contrast are gorgeous and 4. bokeh is like butter. and i should have mentioned sharp, because it's brutally sharp. and my copy is perfectly centred. judging by some reviews, i guess that means i must be pretty lucky. if you've got even the slightest doubts, forget it, this is the best M4/3 lens out there. the price is just silly for the optical quality. Outstanting lens for the price! It's razor sharp from wide open, which is very rare for a fast lens. The bokeh is smooth, which is important for a portrait lens. The AF is fast and silent, wich is wonderfully comfrotable for photo and video. In summary, this is a real gem, every m4/3 owner should have it! I got this over the Christmas holiday on my way to CA. Was able to see it and hold it at a real camera store (Shutterbug in Portland, OR). Fell in love with it right away. What can you say: Sharp, Small, Light, Fast and Excellent. Very pleasing out of focus. Quiet for video. Great lens. Compares very well with my Nocton 40mm f1.4 M lens. Another great lens from Olympus, it will become a classic lens of the system. Must have prime for M4/3 users. Excellent for portraits and shooting people, useful FL. I use it together with together with Lumix 14 mm and Zuiko is better lens, 45 mm became my favorite. Almost no optical distortions and I use it with Panasonic camera - so no software correction. Very shallow DoF, after using zooms you can be surprised by this. Build quality is better than I expected for this price range - it is mainly plastic, but few metal parts: lens mount and 1 metal ring closer to the front. So it feels very solid, better than it actually is. Looks great with black camera. No hood included, unlike Olympus 4/3 lenses - but there are plenty of them on eBay for very reasonable prices. Based on the review(s) by both the expert and users on this website, I purchased this lens yesterday. After only one day, I confirm the rating and comments that others have made are justified. Up to this point my best 4/3 lens was the Panasonic 20mm f1.7 and I am equally impressed with the Olympus 45mm f1.8. This lens is a must for micro 4/3 users if it suits their way of photographing. If you are looking for a short tele prime and you don't need macro, look no further, this is the one to get. Sharpness (even wide open) is very, very good. It has beautiful bokeh and good contrast. Autofocus is smooth, fast, silent and accurate, really good. There is some CA, but it doesn't bother me much. There's a lot of plastic in it, but I don't find that problematic. Time will tell if it's build to last. The lens is very light and small, and to me that is one of the things I like so much about micro 4/3. Not very often I come accross a lens that's that good and that I have little or nothing to complain about. The optional lens hood I did not buy. Instead I bought a more affordable Chinese JCC copy. Apart from a tiny bit of a loose fit, it's just fine. Again, if this focal length is what you are looking for, I don't think that you'll be disappointed. Conclusion First: Just buy it, at this price and un-matched performance; its no brainer. That is the reason it got short in stock everywhere and I felt lucky I got it a day before my holiday. I am replacing my Pany 45-175 with this lens. I know both of different leagues, but even at pixel level this is so sharp, I better get objects (focused) cropped out of the image, besides I also got 100-300mm Pany. I felt that the top of the lens slipped out, if this also happens to you don't worry it is meant to place a lens hood on it, just slide it back on and is fine. I'm using this lens on a Panasonic G3. Optically it can't be beat and it is small and light, the main advantage of the MFT format. It focuses fast and silently. I too am a Canon 5D2 user and with this lens my MFT rig is starting to give me the kind of IQ results I get from my big DSLR, at least for non-moving subjects. It is really sharp and the images it produces are very nice. I'm glad I purchased this lens and I would not hesitate to recommend it to others. Just a few minor nits. You have to pay extra for a lens hood, and I've yet to find one anywhere; the lens cap is only 37mm. This is quite small and I fully anticipate loosing it at some point. It is not much bigger than a half-dollar. Lastly, it would have been nice if this lens doubled as a macro (like my 100mm Canon). None of these concerns are serious though. It is still great at what it does and Olympus has done very well with this one. Gorgeous rendering that rivals other classic rangefinder glass like the Contax G Carl Zeiss T* Planar 45. Overall I'm very impressed with this as a portrait lens, and kudos to Olympus for making such a fantastic lens that makes the Pen system very grown up. As a 5Dmk2 user as well, I find that this combination rivals the big camera well and works perfectly fine as a back-up system for any professional situation. Regardless of the depth of field equivalent of F/3.5 full frame, images speak a lot of words for it's shallow depth of field rendering: http://www.flickr.com/photos/kinematic/6183148494/in/photostream/ You don't have to work too hard to nail focus and also get lovely selective focus with this lens. Couple of things that I wish it had from it's sibling the 12mm F/2 is the snap focus feature (I think all Olympus lenses should have this feature now). But Olympus tried it's best to keep costs down so I respect that. However there is no excuse not to have a lens hood included and also a protective lens pouch. In the past I never used lenses pouches with my larger lenses, but with these smaller rangefinder like lenses, I put all my lenses into pouches before they go into my bag. This is one disappointment I have with Olympus which Panasonic is one step ahead with even their Leica lenses. Hood and Pouch should be included in the price of this. Lastly, the build quality of this isn't the same as the 12mm, however it's also half the price so it's hard to argue that. At the end of the day, this lens is just such a nice little portrait combination that it is easy to overlook it's plastic construction and lack of a physical focus ring. Certainly my favourite lens from Olympus thus far and look forward to more like these in the future.